Time sure flies, doesn't it? Leaves are all down here in Ontario; reports of snow are on the news, not right here yet though, which is good for us. Just got an email and cartoon about "Santa" visiting in approximately 7 weeks. Ugh! Not quite ready for him yet. We just had Thanksgiving and of course Halloween was only in the last week. But yes, Christmas is definately coming, and if you are thinking of baking (which would make sense) check out holiday baking on the site, and maybe you can find something to do with your rhubarb in that department. There are lots of things you can make, and keep it "christmas-y" too. 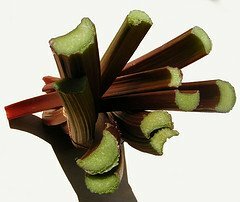 A few similar questions have been asked on how to prepare for winter regarding the leftover rhubarb stalks that are just lying around still in the garden. Just let them die off and as they do, clear them away. Make sure to mix in with some good rotted compost. Basically, just tidy up the area and forget about them. 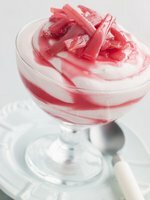 Tip - Lowering the acidity of rhubarb and cutting down on the sugar needed involves a little bit of baking soda. Soak your rhubarb in cold water and add a pinch of baking soda to it. The water will turn black. Drain off this water, refill your pot with fresh clean water and continue with your recipe. Because you have removed the acidity, the sauce is sweeter with less sugar. 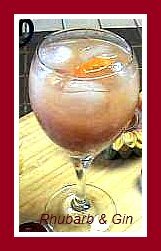 This tip came from "Just Easy Recipes", A South African Guide to Simple Tasty Recipes. Still making jam? Does it get any easier than this one? If you like bananas, try this jam, courtesy of "Karols Kitchen." Mix well, and boil for 35 minutes or until well thickened. Thanksgiving is behind me, but not for a number of you out there. Care to do something a little different for dessert? This prizewinning recipe has a story to it, and Bob Grawey, a staff writer for the "Star News Minnesota" wrote about it recently. "Barb" did not win in an earlier Minnesota State Fair Contest, but was determined to win the Ghirardelli Contest at the Fair. She thought of what her family liked best, and came up with this recipe. It took her some time to get the ingredients right, and get her pie entered by 3 p.m. all on the same day. She and her husband fought being stuck in traffic on a bus, and had to literally run on foot yelling to people to clear the way, to get her pie entered on time. She won first place, as the judges were impressed with the combinations of fruit and chocolate. One thing Barb never told anyone - she never did sample the pie before she entered it! If you like rhubarb, cheesecake, raspberries and chocolate, give this prize-winner a try. 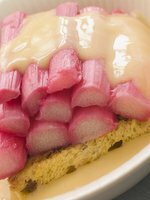 *Thawed and drained rhubarb can be used. Ever visited the Royal Horticultural Society? 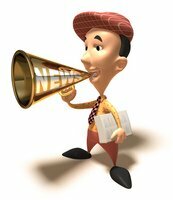 It is the UK's leading gardening charity dedicated to advancing horticulture and promoting good gardening. Their goal is help people share their passion for plants, to encourage excellence in horticulture and to inspire all of those with an interest in gardening. According to the RHS, November is an excellent time to plant a rhubarb crown, so if you have one, get into the ground now. I wish everyone a very Happy Thanksgiving in the US - don't forget there are some stuffing recipes using rhubarb on the site. Check them out.